By now most of you have probably heard about Monday being the Chinese New Year, this year being the year of the ox. I wanted to celebrate but had something to do Monday night so I had to postpone my celebration. Yesterday may have been ideal for implementing my celebratory plans, as the weather was all sorts of snowy and icy and I worked from home, meaning I should have had plenty of time to make dinner, however, I wasn’t hungry at dinner time because I ate lunch too late. So tonight it is Chinese New Year at Mark and Renae’s! The holiday is traditionally celebrated over 15 days anyway, so I don’t feel too bad about being a couple of days late. 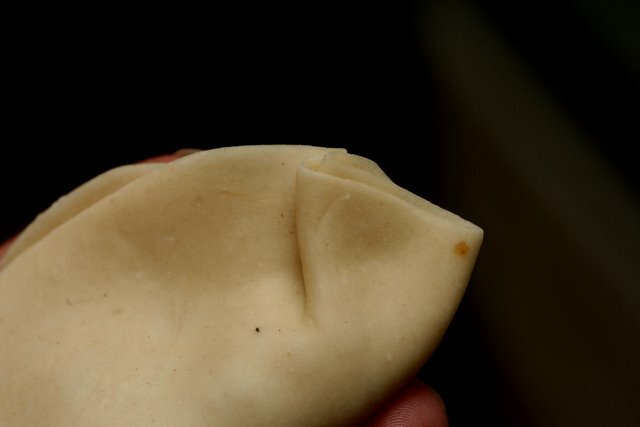 I just wanted something light for dinner tonight so this is not an elaborate feast, but I did do something special and that is I made pot sticker wrappers from scratch for the first time. I usually buy pre-made wrappers from Super H, and frankly, although they consist of no more than flour and water, making my own never even occurred to me. I’m not really good with things that need to be rolled out evenly. It seemed like an unfathomable amount of work. As I mentioned earlier, though, the weather is being stupid here and I didn’t have any wrappers in the house. And I’d seen Jes’s pot stickers on Cupcake Punk the other day, which inspired me. 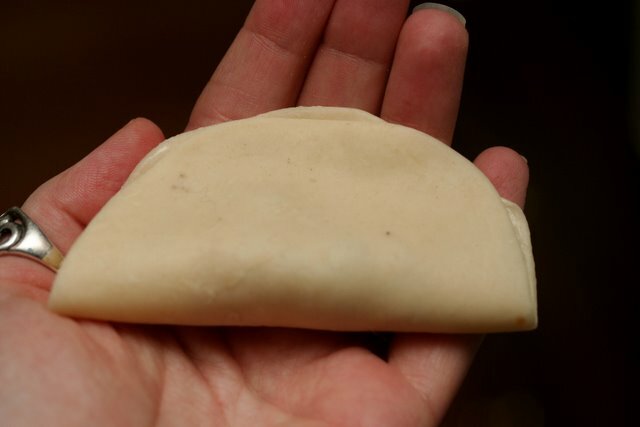 So, home early tonight, I embarked on my first pot sticker wrapper journey. The journey wasn’t nearly as bad as I thought it would be! 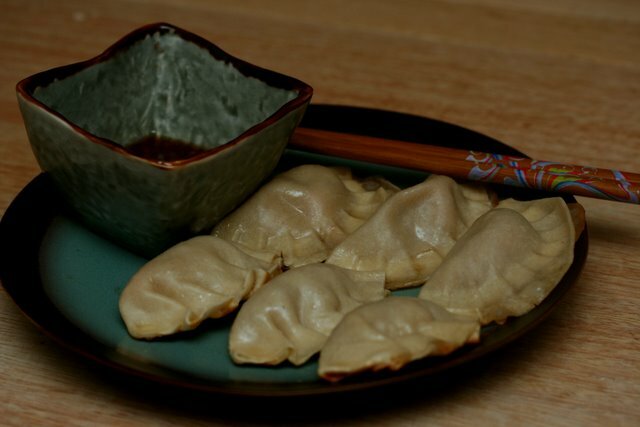 These recipes were adapted from Bryanna Clark Grogan’s Authentic Chinese Cuisine. 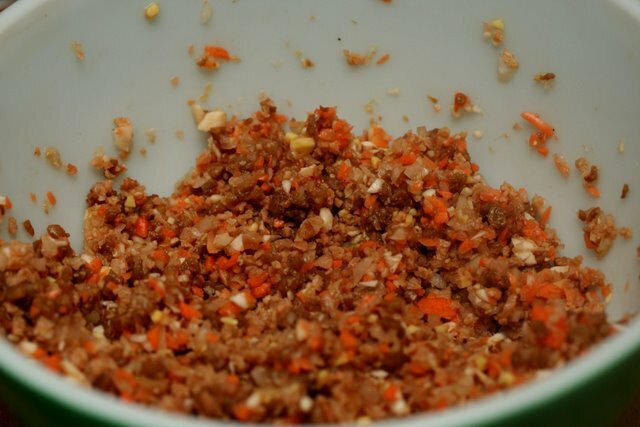 Mix with the remaining ingredients in a medium bowl. 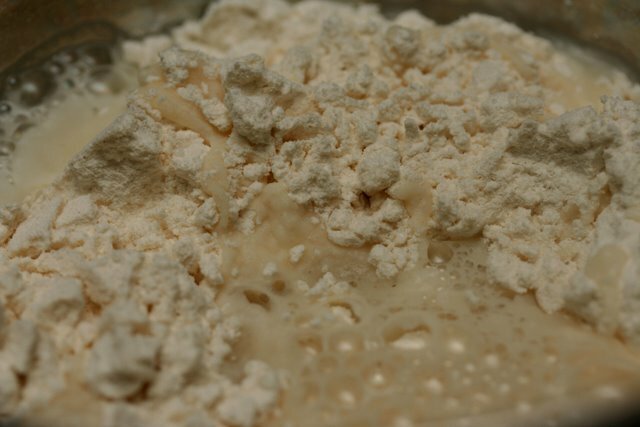 Mix the flour and water together, either with a wooden spoon (or your hands) in a bowl, or in a food processer. 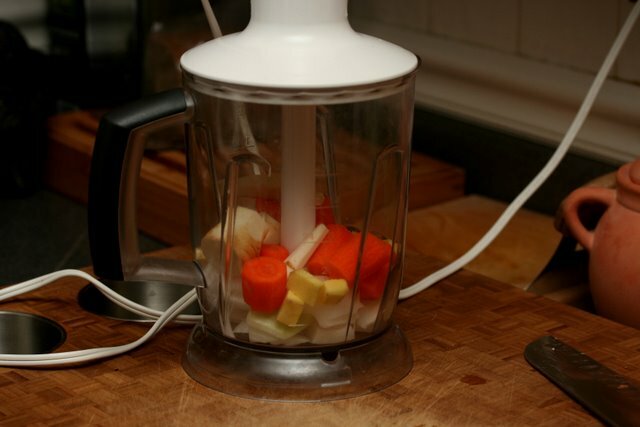 If using a food processor to knead, pulse for about 30 seconds. If kneading by hand, knead for about 5 minutes. 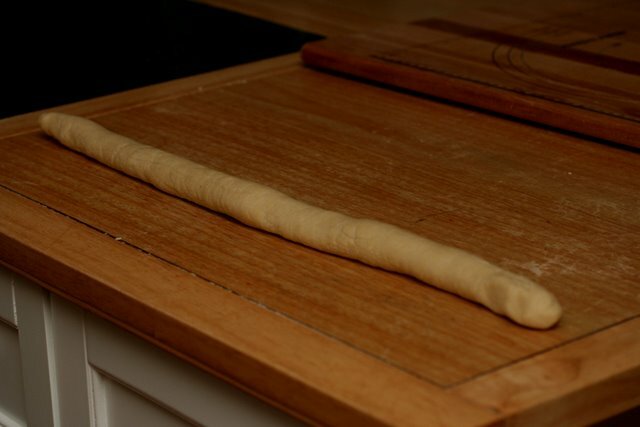 Roll dough out into a long “rope”. Cut off a piece about 1″ long and flatten a bit. 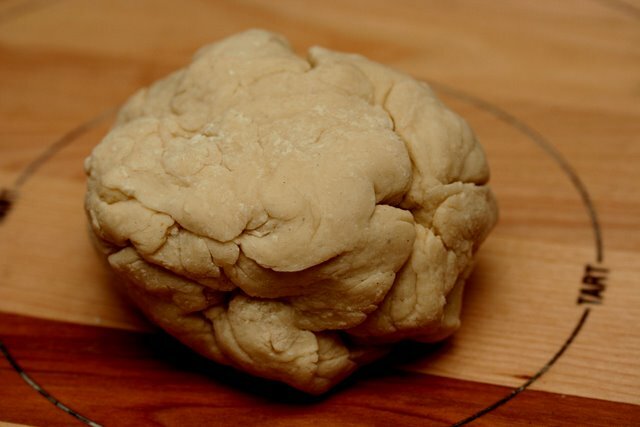 As you are working, keep the unused dough covered with a wet tea towel to prevent it from drying out. 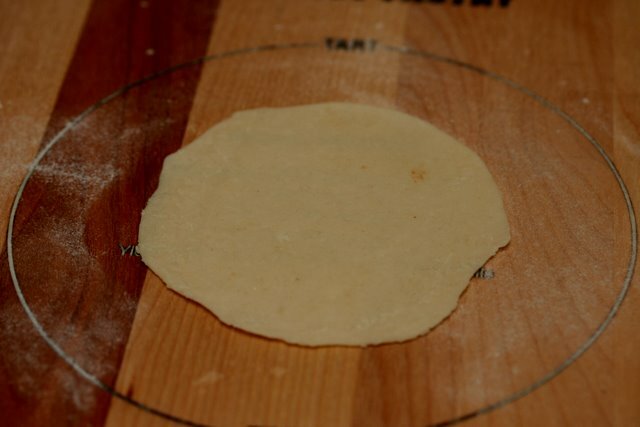 Using a rolling pin, roll the lump of dough out into a thin circle about 3 1/2″ in diameter. I rolled out about 5 wrappers, then filled and sealed them, then rolled out 5 more wrappers, etc. 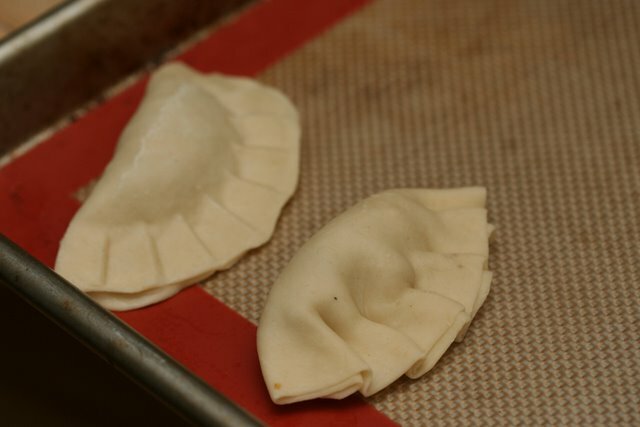 For sealing the filled wrappers, you have two choices: you can either use a pot sticker press or you can pleat them by hand. 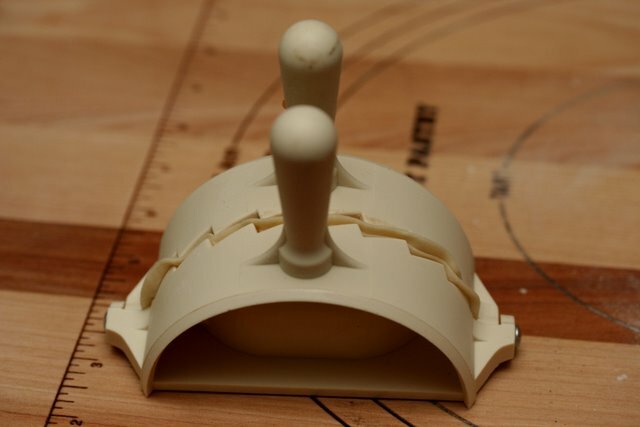 Until tonight, I have always used a press because I figured it was really hard to do by hand. I was wrong; it’s really pretty simple and nearly as fast as using the press once you do it once or twice. 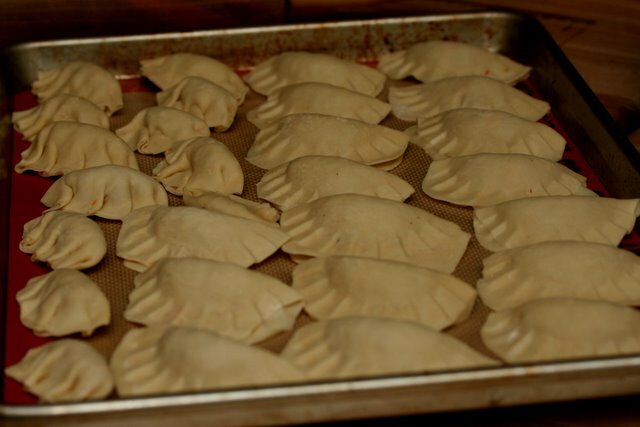 I had to do about half of my dumplings by hand tonight whether I wanted to or not because my wrappers were too small for the press. In either case, have a small bowl of water handy. 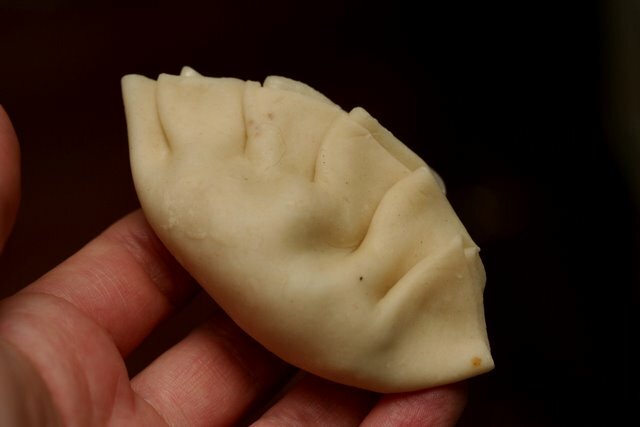 Dip a finger in the bowl of water and rub it along the outer edge of half of the dumpling. 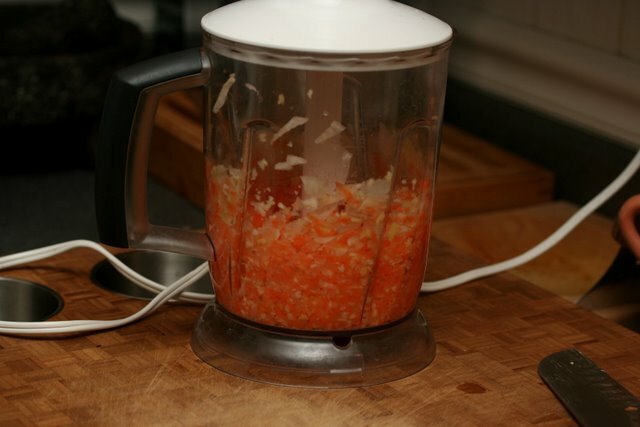 Then close the press and squeeze lightly. 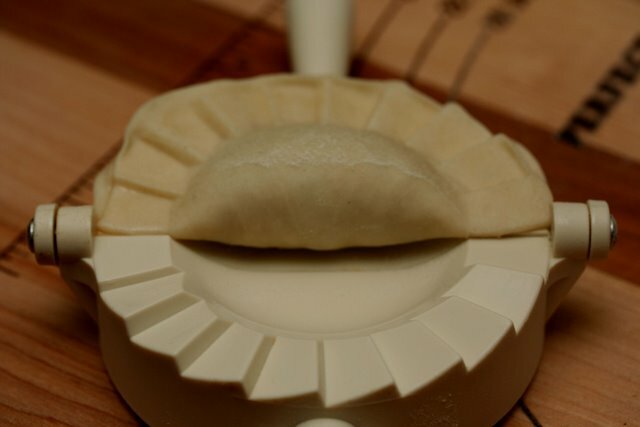 Open the press and remove the dumpling. 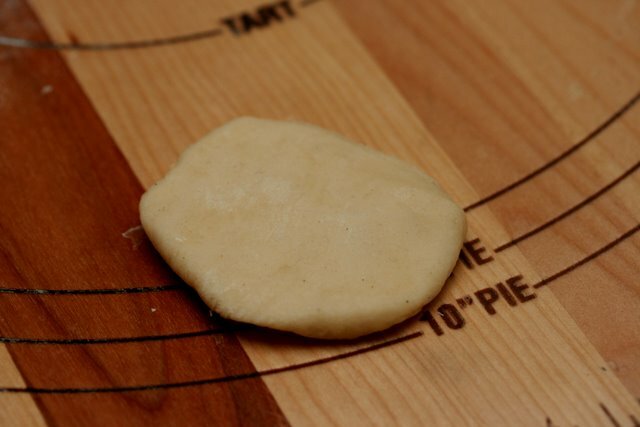 To pleat by hand, place a wrapper in your palm and then place a scant tablespoon of filling in the center. 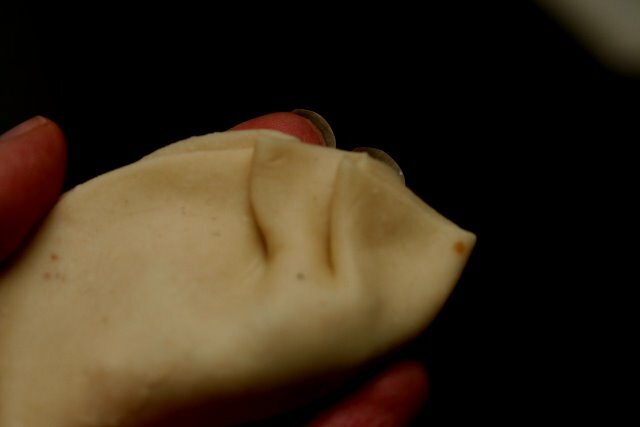 Lightly wet half of the outer edge with your finger as described above, then fold the dumpling in half, squeezing the edges together to seal. 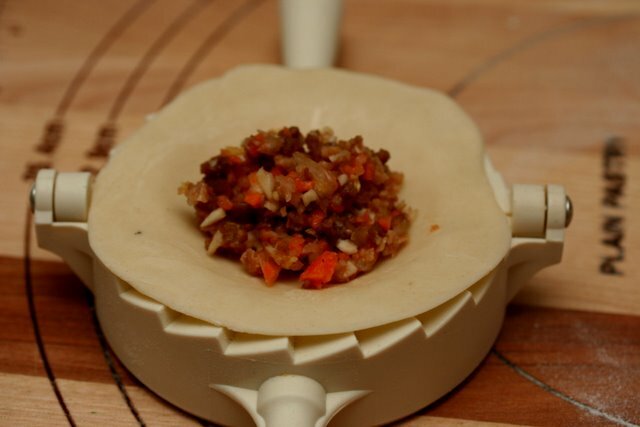 Continue until either all the dough or all the filling is gone – hopefully they are about even – placing the filled dumplings on a cookie sheet and covering with a towel so they don’t dry out. To pan fry, heat a large skillet until hot. Add a tablespoon of oil (I used peanut oil with a bit of sesame oil mixed in, as Bryanna suggested) and tilt the skillet until it is coated evenly. 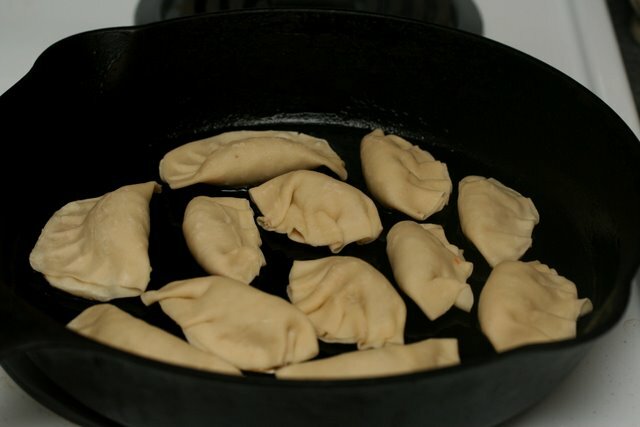 Place as many dumplings as you can fit into the skillet without overlapping, pleated side up. 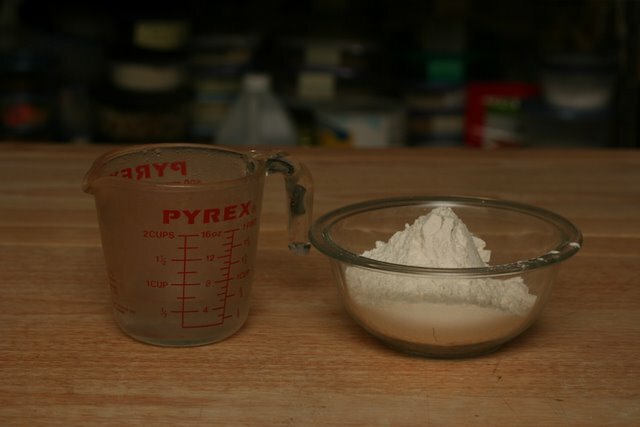 After two minutes, pour 1/3 cup water into the pan and immediately cover. 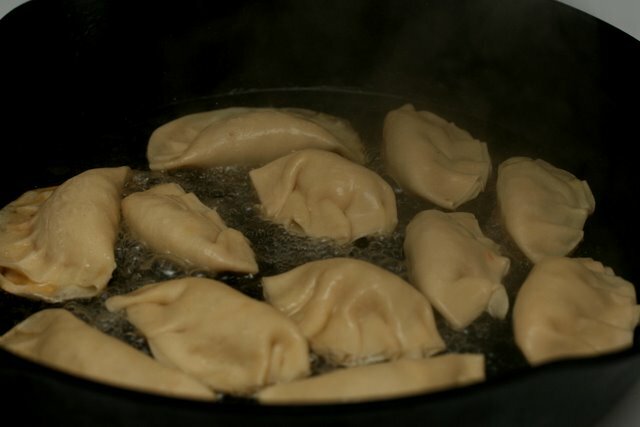 The dumplings will have puffed up a bit. 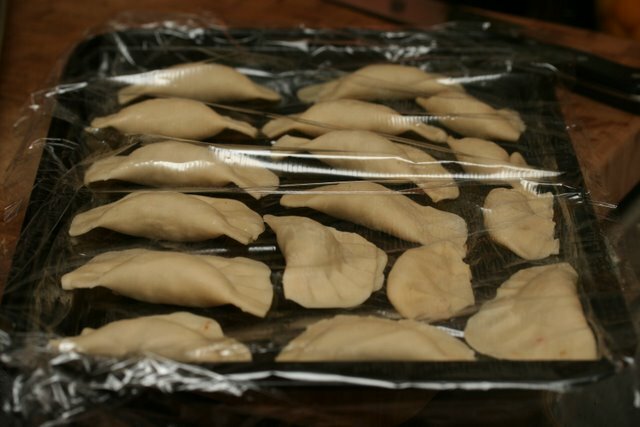 To freeze leftover (un-fried) dumplings, place the dumplings in a single layer on a cookie sheet and cover with plastic wrap to avoid freezer burn. When they are frozen, remove from the cookie sheet and place in a freezer bag. 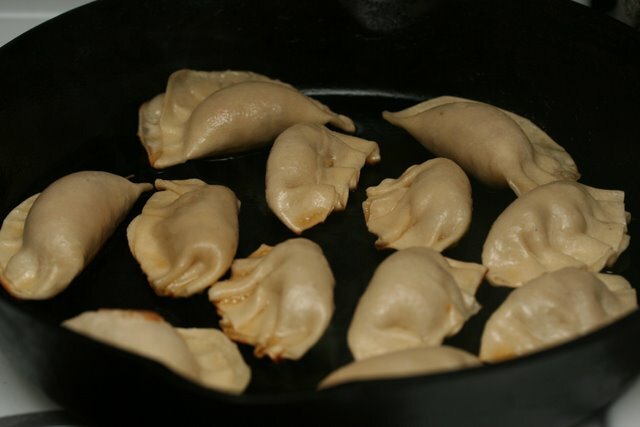 Cook them exactly as you would fresh dumplings: no need to thaw. 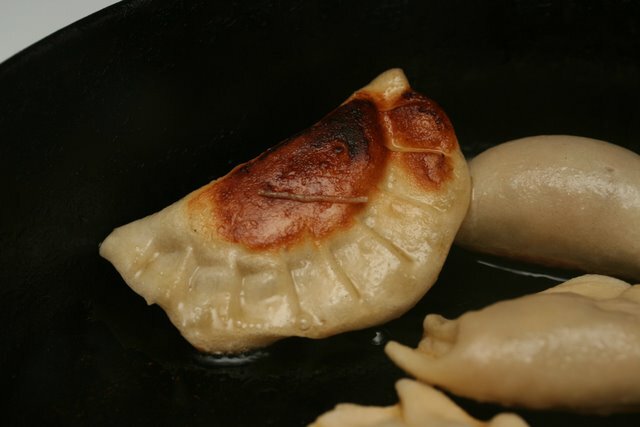 Serve pan-fried dumplings with a dipping sauce. 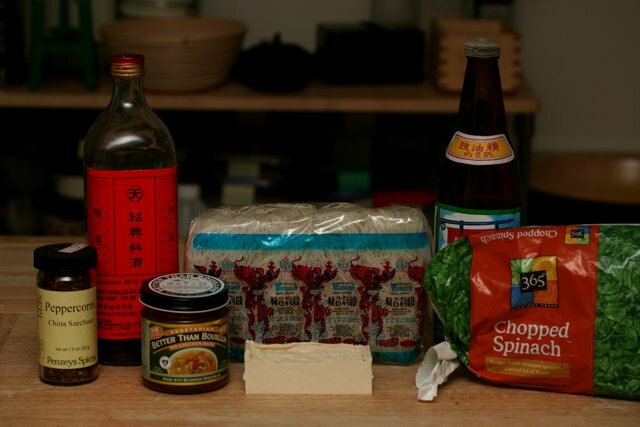 I usually just throw together a couple tablespoons of soy sauce, shaoxing wine (substitute dry sherry), vinegar, hot chili oil, and garlic. 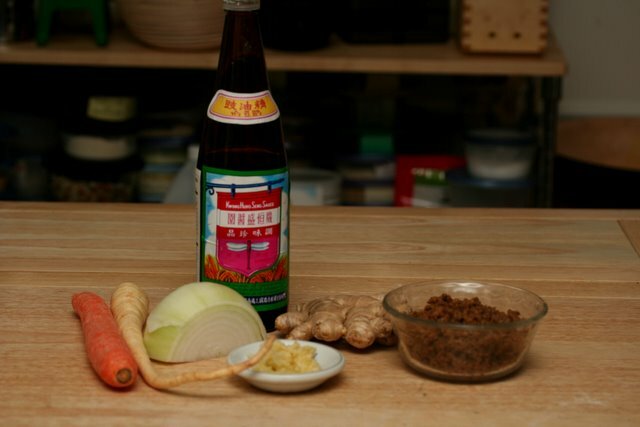 Your dipping sauce could be as simple as soy sauce and vinegar or soy sauce and sesame oil. Although I wasn’t hungry for an elaborate meal, eating nothing but pot stickers for dinner seemed a little wrong, so I also threw together a very fast soup. I just flipped through the same cookbook to find a soup that was very quick to make and called for only ingredients I had on hand. This one fit the bill perfectly (though I had to use frozen instead of fresh spinach). 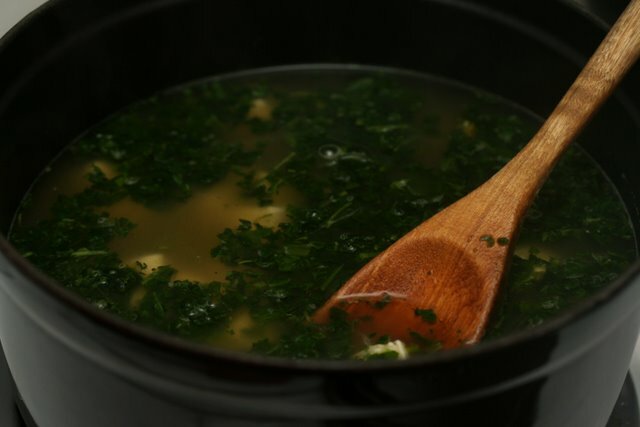 Place all ingredients into a small pot. Season with sichuan pepper if you’d like. Cook for 5 minutes. Eat. And that was my little Chinese New Year celebration! Happy Year of the Ox everyone! Oh! This is amazing. 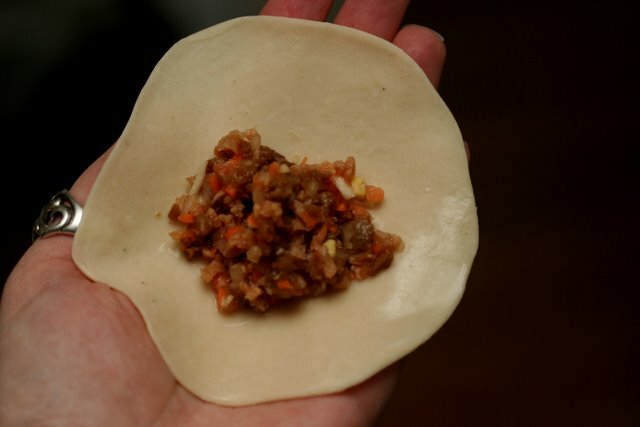 I submitted a potsticker recipe to a cooking contest and I wasn’t sure if I was going to be able to cook it if I couldn’t find eggless wrappers. Now I can make them!! How did they work out? They look beautiful. Wow those are some great recipes! 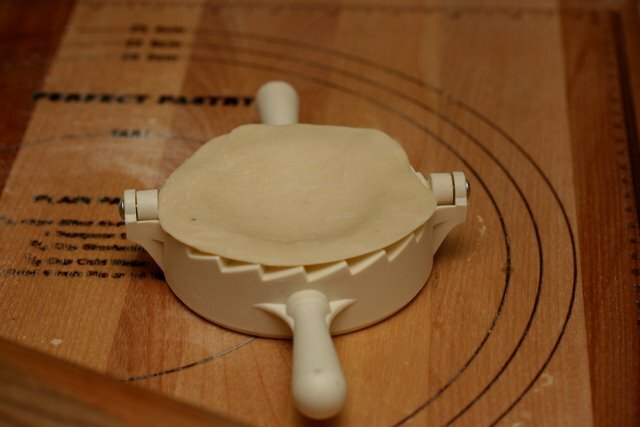 I need one of those dumpling press things that is great! Kibbles, they turned out great! It wasn’t quite the ordeal I was expecting it to be and other than their uneven sizes and shapes, the wrappers were like store-bought in every way. Most of mine were nowhere near being perfect circles though! Lindsay, thanks! The dumpling press was a couple of bucks at an Asian grocery store. I’ve also seen them at World Market. Beautiful! Your folded your wrappers with more ease that me. And Super H! Oh how I love that store! We have two in Atlanta, far far away from the downtown area where I live, but when I spent a summer in the suburbs right around the corner from one I was in heaven. Cindy, why do I think I need to re-watch Groundhog Day? Jes, I didn’t know they had Super Hs in Atlanta! Parts of it are very scary, but if you avoid the seafood department, it’s simply wonderful! 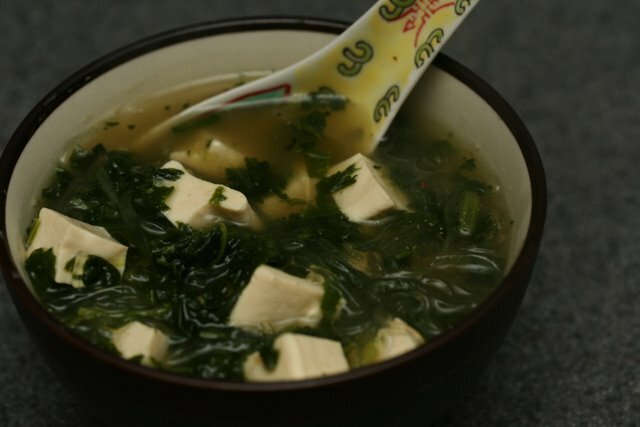 Lily, I’m very glad to hear that because I read somewhere that tofu is avoided on Chinese New Year because the color white symbolized death. Hopefully the bean threads canceled that out! I made both of the dishes yesterday. I had a bit of issue with my dough sticking together, but that is because I decided to put chopped kale in mine so all the juice from the kale was making the dough too wet. I ended up getting the hang of it and made some pretty good potstickers. They used to be my favorite chinese food when I was little. I’d want to order them instead of a full meal. These were so similiar, yet healthier, and cruelty-free. Yay!